Welcome to the Waterways. We hope you settle into your new home quickly and that you will enjoy living here. If you have not lived on a development like the Waterways before, the About the Waterways section of this site is a useful introduction of how the development is managed and maintained. The Waterways is a safe and friendly environment and our younger residents enjoy access to playgrounds and playing fields within easy walking distance from where they live. The SHOUT project provides further opportunities for parents, children and young people to meet, have fun, and learn together. Visit the Clubs and Societies section for more information about SHOUT. For a modern estate the Waterways is surprisingly rich in wildlife. The setting of the estate, surrounded as it is by wild areas, gave us a good start, and now the original plantings and little gardens have matured to give more scope for the animals, birds and invertebrates who live with us in the Waterways. Bordering the west edge of the estate is the railway with the nature reserve of Burgess Field and Port Meadow beyond to the west. The railway lines are not constantly busy and therefore provide a permanent corridor for wildlife to use. Cutting through the central part of the estate is our own wildlife corridor. This is a wonderful strip of land connecting Hook Meadow in the north to the Trap Grounds in the south. There is a small stream running through the corridor and some interesting and rare sightings have been made along here. 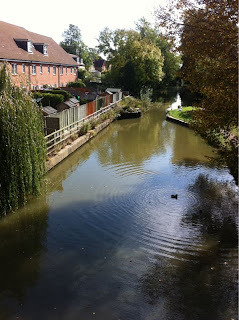 Just east of that is the Oxford canal, a delightful waterway and pathway. Moving farther east we have the lake, once a quarry for clay which was used in brick making, and a wilderness area beyond it. In addition to these features there are many gardens, some very tiny but still attractive to wildlife. The animals seen on the estate include mammals such as badgers, foxes, muntjac deer, and hedgehogs and many small animals such as field mice, voles, shrews etc abound in the areas of taller vegetation. If you are lucky you might see a water vole here. We see bats in the summer and of course the ubiquitous and extremely clever rat is around too. There are so many birds in the area, especially now our trees are maturing. Many of them are actually nesting here now the plantings are more mature and dense. Sometimes we have ducks just walking about the estate or resting in the sunshine; there might be a heron looking hopefully at the lake, or a buzzard circulating high overhead. Tawny owls are often heard calling just close to Stone Meadow. The rare water rail sometimes puts in an appearance pottering along the wildlife corridor and reed warblers warble away in the reeds there in the summer, almost always frustratingly out of sight. A kingfisher visits occasionally and woodpeckers are seen and heard frequently. Then there are the amphibians; frogs are common, newts less so, reptiles such as the grass snake like the watery areas and slow worms are occasionally seen. When it comes to insects, this is a very rich habitat, supporting many butterflies, dragonflies and a great variety of other insect life, sometimes including the extraordinary glow-worm. The insects attract bats and birds and help to promote the biodiversity of the area. The variety of wildflowers and garden flowers produce pollen and nectar for bees and butterflies and berries provide food for birds in the autumn. Despite being a large new estate, the Waterways is a richly biodiverse area supporting a delightful variety of interesting wildlife. The Practical Information section has lots of useful information about the Waterways development and services available to you. If you’re new to the area, check out our Local Services and Information section for all you need to know. From restaurants to a plumber you can trust, we’ve got the inside knowledge. There are several clubs and societies running on the development and events are always going on. The Events section lists all upcoming events and the Clubs and Societies section provides information on the various groups that are active in the Waterways. Get to know your neighbours and get involved today. We’re always looking for ways to improve our website so any comments and suggestions will be gratefully received. Please contact the web administrator, Claudia Molina, with your ideas.